Left untreated, this deformity may progress, despite the use of orthotics or corrective shoes, resulting in the medial collapse of the ankle and foot. After skeletal maturity, the only remedy is to perform a supramalleolar osteotomy. However, in growing children, there is the opportunity to intervene by means of guided growth or hemiepiphysiodesis of the distal medial tibia. This article focuses on discussing the pathophysiology and evolution of ankle valgus and elucidating the role of guided growth (prior to skeletal maturity) to reverse this problem, without the need for osteotomy. If the physis has closed, an osteotomy will be required. Normal ankle alignment. 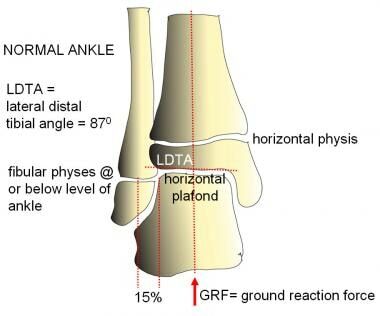 The lateral distal tibial angle (LDTA) is 87º, and the fibular physis is at or distal to the level of the plafond, which is horizontal and, thus, perpendicular to gravity. In the normally aligned extremity, the mechanical axis bisects the knee and ankle, at an angle of 3º with respect to the vertical (gravity). The tip of the fibula is caudad to the medial malleolus, and the fibula serves as a lateral buttress to the ankle, bearing up to 15% of the weight. This preserves a horizontal plafond and ameliorates strain on the deltoid and tibiofibular ligaments. The alignment of the tibial and fibular physes, along with the ankle plafond, parallel to the floor and perpendicular to gravity permits the physeal and articular cartilage chondrocytes to resist compression—a task for which they are well suited—while sparing them from shear forces. If the fibula is foreshortened because of developmental, posttraumatic, or iatrogenic causes, the lateral buttress effect is lost. As the ankle tilts and the ground reaction force shifts laterally, the balance changes. The deltoid and interosseous ligaments are subject to strain, and the lateral distal tibial epiphysis is compressed, resulting in characteristic wedging. The distal fibular epiphysis may enlarge, reflecting the Heuter-Volkmann principle as it impinges on the hindfoot and assumes increased weightbearing stresses (see the image below). Lateral impingement may be due to ankle valgus, hindfoot valgus, or both. This is an extreme example. This process continues in a vicious circle that is refractory to shoe modification or bracing; eventually, surgical intervention is needed. Ankle valgus may also contribute to progressive outward rotation of the tibia and result in secondary valgus strain on the knee. The severity and progression of ankle valgus may be assessed on the basis of the Malhotra grading system (see Workup). Depending on the etiology, ankle valgus is often bilateral; its overall frequency is unknown. It is far more common than ankle varus and may accompany (or mimic) hindfoot deformities, compounding their management. Developing during childhood, if left untreated, it may become relatively disabling by the time of skeletal maturity. As ankle valgus corrects, bracing is facilitated or (in some cases) obviated, and shoewear improves. Lateral impingement and subfibular pain are ameliorated. Compared to the knee, where rapid improvement is noted, the ankle grows slowly. This is especially true in patients with neuromuscular compromise or skeletal dysplasias. Nevertheless, over the course of 18-24 months, most children will manifest signs of clinical and radiographic improvement. The flexible extraphyseal implant may be left in situ longer, if necessary. The theoretical risk of physeal closure is progressive ankle varus (not encountered to date); this may be remedied with an opening wedge supramalleolar osteotomy. Lewin SO, Opitz JM. Fibular a/hypoplasia: review and documentation of the fibular developmental field. Am J Med Genet Suppl. 1986. 2:215-38. [Medline]. Lundberg A. Kinematics of the ankle and foot. In vivo roentgen stereophotogrammetry. Acta Orthop Scand Suppl. 1989. 233:1-24. [Medline]. Tickle C. Genetics and limb development. Dev Genet. 1996. 19 (1):1-8. [Medline]. Cuervo M, Albiñana J, Cebrian J, Juarez C. Congenital hypoplasia of the fibula: clinical manifestations. J Pediatr Orthop B. 1996 Winter. 5 (1):35-8. [Medline]. Stevens PM, Aoki S, Olson P. Ball-and-socket ankle. J Pediatr Orthop. 2006 Jul-Aug. 26 (4):427-31. [Medline]. Stevens PM, Otis S. Ankle valgus and clubfeet. J Pediatr Orthop. 1999 Jul-Aug. 19 (4):515-7. [Medline]. Malhotra D, Puri R, Owen R. Valgus deformity of the ankle in children with spina bifida aperta. J Bone Joint Surg Br. 1984 May. 66 (3):381-5. [Medline]. Lampasi M, Antonioli D, Di Gennaro GL, Magnani M, Donzelli O. Congenital pseudarthrosis of the fibula and valgus deformity of the ankle in young children. J Pediatr Orthop B. 2008 Nov. 17 (6):315-21. [Medline]. Takikawa K, Haga N, Tanaka H, Okada K. Characteristic factors of ankle valgus with multiple cartilaginous exostoses. J Pediatr Orthop. 2008 Oct-Nov. 28 (7):761-5. [Medline]. Gibson V, Prieskorn D. The valgus ankle. Foot Ankle Clin. 2007 Mar. 12 (1):15-27. [Medline]. Nabeshima Y, Mori H, Fujii H, Ozaki A, Mitani M, Fujioka H. Ankle valgus and subtalar varus in treated clubfoot. J Foot Ankle Surg. 2009 Nov-Dec. 48 (6):615-9. [Medline]. Takakura Y, Tanaka Y, Kumai T, Sugimoto K. Development of the ball-and-socket ankle as assessed by radiography and arthrography. A long-term follow-up report. J Bone Joint Surg Br. 1999 Nov. 81 (6):1001-4. [Medline]. Burghardt RD, Tettenborn LP, Stücker R. Growth Disturbance of the Distal Tibia in Patients With Idiopathic Clubfeet: Ankle Valgus and Anteflexion of the Distal Tibia. J Pediatr Orthop. 2016 Jun. 36 (4):343-8. [Medline]. Machen MS, Stevens PM. Should full-length standing anteroposterior radiographs replace the scanogram for measurement of limb length discrepancy?. J Pediatr Orthop B. 2005 Jan. 14 (1):30-7. [Medline]. Stevens PM. 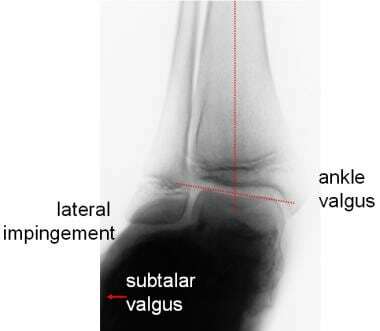 Effect of ankle valgus on radiographic appearance of the hindfoot. J Pediatr Orthop. 1988 Mar-Apr. 8 (2):184-6. [Medline]. Stevens PM, Toomey E. Fibular-Achilles tenodesis for paralytic ankle valgus. J Pediatr Orthop. 1988 Mar-Apr. 8 (2):169-75. [Medline]. Aurégan JC, Finidori G, Cadilhac C, Pannier S, Padovani JP, Glorion C. Children ankle valgus deformity treatment using a transphyseal medial malleolar screw. Orthop Traumatol Surg Res. 2011 Jun. 97 (4):406-9. [Medline]. Hou ZH, Zhou JH, Ye H, Shi JG, Zheng LB, Yao J, et al. Influence of distal tibiofibular synostosis on ankle function. Chin J Traumatol. 2009 Apr. 12 (2):104-6. [Medline]. Chu A, Ong C, Henderson ER, Van Bosse HJ, Feldman DS. Distraction Osteogenesis of the Fibula to Correct Ankle Valgus in Multiple Hereditary Exostoses. Bull Hosp Jt Dis (2013). 2016 Nov. 74 (4):249-253. [Medline]. Paley D, Herzenberg JE. Principles of Deformity Correction. Berlin Heidelberg New York: Springer-Verlag; 2002.
van Oosterbos M, van der Zwan AL, van der Woude HJ, Ham SJ. Correction of ankle valgus by hemiepiphysiodesis using the tension band principle in patients with multiple hereditary exostosis. J Child Orthop. 2016 Jun. 10 (3):267-73. [Medline]. [Full Text]. Stevens PM, Belle RM. Screw epiphysiodesis for ankle valgus. J Pediatr Orthop. 1997 Jan-Feb. 17 (1):9-12. [Medline]. Driscoll MD, Linton J, Sullivan E, Scott A. Medial malleolar screw versus tension-band plate hemiepiphysiodesis for ankle valgus in the skeletally immature. J Pediatr Orthop. 2014 Jun. 34 (4):441-6. [Medline]. Malhotra classified progressive ankle valgus, which is directly proportional to the degree of fibular physis elevation (stage 0 = normal). The described triad of fibular physis elevation, wedging of the lateral tibial epiphysis, and ankle tilt may be accompanied by horizontal expansion of the fibular epiphysis (impingement), medial clear space widening, and avulsion injuries of the tip of the medial malleolus. One needs to differentiate between ankle valgus (shown here) and hindfoot valgus. It is imperative to obtain a standing anteroposterior radiograph of the ankle when evaluating foot problems. Patients may have valgus at more than just the hindfoot and ankle. This boy with congenital clubfeet has genu valgum compounding his gait problems. Transmalleolar screws, though easy to insert, may be difficult to remove. Shown here are two complications: screw breakage and intra-articular migration of the screw head, reflecting the drawbacks of imposing a rigid restraint on a dynamic and growing physis. This patient (see also image below) failed to return for follow-up for 24 months following medial malleolar epiphysiodeses. There is obvious iatrogenic varus with tenting of the physes and risk of premature closure. These screws were removed (with difficulty) on an urgent basis (see also image above). This patient had asynchronous medial malleolar epiphysiodeses. The screw on the left could not be retrieved. His opening wedge osteotomy to correct iatrogenic varus collapsed into a nonunion, necessitating salvage with a Taylor spatial frame. This unfortunate sequence would not have happened with an eight-Plate. A drawback of the intraphyseal fulcrum is the rigid constraint of the physis. Correction is relatively slow and inefficient when compared to the flexible, extraphyseal eight-Plate. The nonlocking eight-Plate is placed superficial to the intact periosteum. As lateral growth occurs, the screws diverge, permitting safe and gradual correction of the valgus deformity. The ground reaction force moves medially, toward the center of the ankle. The distal tibial physis can expand and grow laterally; the articular cartilage is spared from harmful shear forces. The fibula may not respond in a synchronous manner. However, as lateral impingement is alleviated, symptoms abate and there are no functional consequences. In children, it is not necessary to lengthen the fibula or fuse it to the distal tibia. Through a 2.5-cm incision, one can place a Keith needle into the distal tibial physis, preserving the periosteum. Center the eight-Plate on the physis, and secure it with the 4.5-mm cannulated screws (either 16 or 24 mm). Place the epiphyseal screw first, with care to avoid the ankle joint or physis. Fluoroscopic sequence showing the steps. The 24-mm screws are preferable if there is enough space to insert them. Sick physes are not a contraindication to medial malleolar epiphysiodesis, even with screws. Note the remodeling of the distal tibial epiphysis as the ground reaction force is restored to neutral and the plafond rendered horizontal. Ankle valgus is relatively common in children with previously operated clubfeet. While these feet may be presumed to be overcorrected, ankle films may reveal ankle valgus and lateral impingement. If the feet are flexible, it may be preferable to deliberately overcorrect into 5º of ankle varus before removing the plates. Continue to observe the child annually until maturity, and repeat as needed. Presenting with an anterolateral bow and initially intact fibula, this child went on to a fibular fracture/pseudarthrosis and ankle valgus by age 3 years. Note the medial widening. It is not necessary to fix, bone-graft, or lengthen the fibula, nor is it helpful to create a tibia-fibular synostosis. The medial malleolar screw was placed at age 4 years, and over the ensuing 2 years, the valgus corrected into slight varus. This procedure was repeated at age 7 years and again at 9 years, employing the eight-Plate. This 12-year-old boy with hemiplegia underwent a rotational supramalleolar osteotomy. Despite the fibula being left intact, he drifted into valgus over the ensuing year. This 10-year-old boy demonstrates the stigmata of hereditary multiple exostoses, with concurrent knee and ankle valgus. These deformities were managed by eight-Plates applied to the distal medial femora and distal medial tibiae. The deformities corrected over the ensuing year, and the plates were then removed. This 9-year-old patient with spina bifida had progressive and symptomatic ankle valgus. One year following eight-Plate insertion, it is evident that the 16-mm screws are losing their grip. The goal was to achieve slight varus overcorrection. In this patient (see also image above),the plates were moved distally and resecured with 24-mm screws. Fast Five Quiz: Can You Properly Address Hip Fractures?